Greenland - What are we about to lose? My perfect place to be is always by the sea, with the sand in my hair and fins on my feet. Ready to jump in and go for a little snorkel with my camera, for a dive, or to just chat with the local kids or fishermen. Last year, I spent three months in Madagascar swimming with turtles and whale sharks, during which time I learned about the reef and how it is being affected by warm and acidic waters. I am not sure about you, but I have started to have endless questions of why the coral are bleaching, how is this happening, where it starts, can it be prevented or slow down? I am not a scientist. Everything you will read in this post, is what I have learned while researching the problem and while being in the ‘field’. We hear about global warming and climate change from each and every corner. There are several web sites, where they educate you about the problem, explain the main issues and make ask you to sign up to newsletters, sometimes asking for donations or a signature to stop this and that action. The fact is that earth has experienced global warming before. The earth went through global changes such as a long period of ice and long period of warmth. These were trigged naturally, by the sun and by how it’s light reached Earth’s surface. However, since the 18th century, as we are powering our modern life, we are releasing heat-trapping gases called greenhouse gases which are staying in the atmosphere from a few years up to thousands of years, warming up our planet and ‘thickening up the Earth’s blanket. 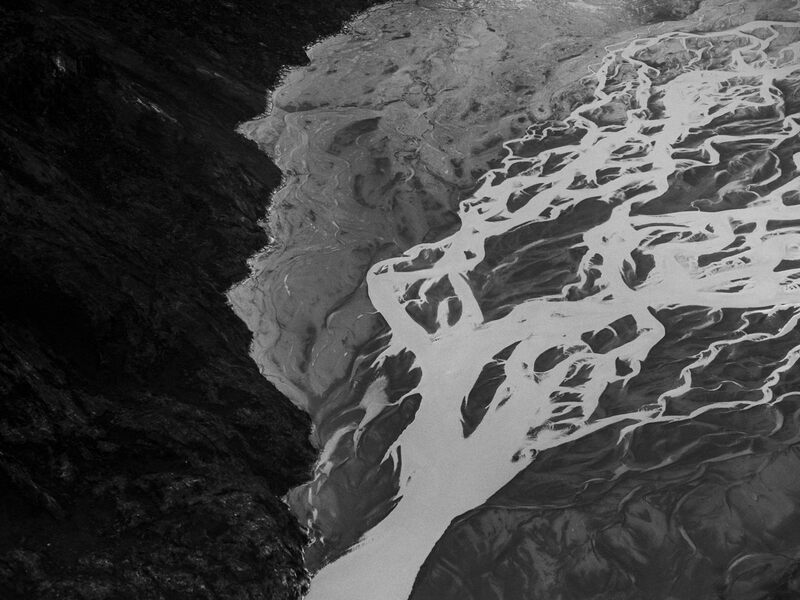 Two of the biggest issues are the raising acidity of oceans and the melting of glaciers. The fact that sea levels are rising has not only effected the wildlife of Greenland, but in fact, it’s affecting places like Maldives, Seychelles or Tuvalu, which is home to a spectrum of ecosystems and a variety of coral reefs. So I planned this trip to the land of lower temperatures and bought a whole new wardrobe, as I have been chasing summer for the past 8 years, and teamed up with Olympus Australia who were supporting this trip from all sides. To arrive or leave Greenland you have to come through the international airport of Kangerlusuaq. Many people just stay for several hours here, while waiting for their connecting flight elsewhere. I have decided to stay here for couple of days, to get a feel of a different place, to see different landscapes. I spent the first couple of days in Kangerlussuaq, which as a settlement is very young. Fifty years ago, no one was born here, no one died. While in the past, this was the fuel stop for the military, these days, it is an international airport that you must enter through and leave when in Greenland. The area, situated 20km from the sea, receives very little rainfall. During my time here, we went on a hike near lake Ferguson, to see if we could spot some Muskoxens. This artic mammal is known for their thick coat that easily protects them in wintertime. However, as our local guide told us, due to rising temperatures, they are facing the threat of extinction due to diseases and bacteria spreading in warmer weather. 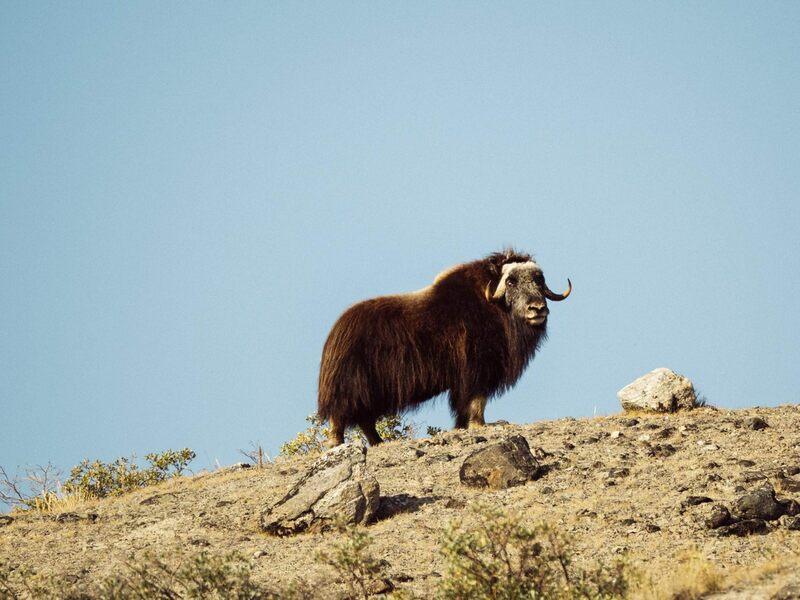 These bacteria are not only attacking Muskoxens, but other artic mammals too. The very next day, we headed towards the Ice Cap, which is also called Greenlandic ice sheet and is the second largest ice sheet in the world, covering 80% of the land here. It’s made up of layers of compressed snow, built up over the past hundred thousand years. 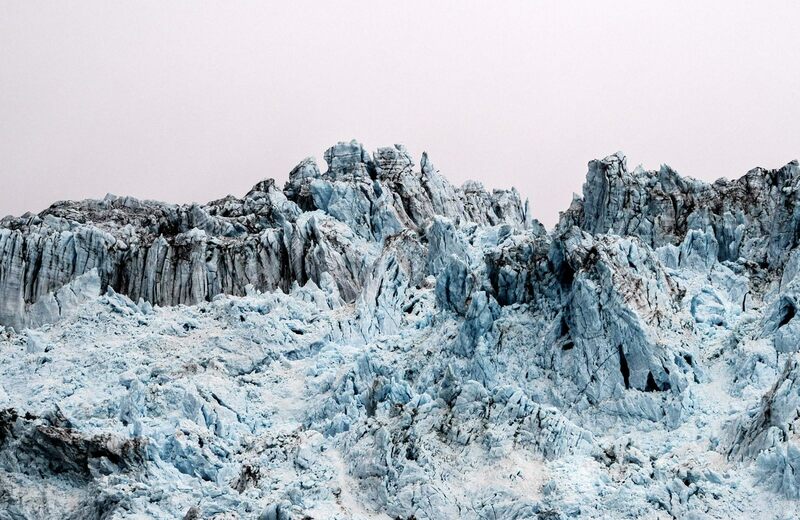 Every year, Greenland’s ice sheet grow from snow and freezing rain (from September to May) and shrink through the months of June – August due to melting when the ice is the most active. The roads leading from Kangerlussuaq are pretty rough but observing the peaceful nature, with reindeers and muskoxens in the background made it a little less stressful. Arriving to the ice sheet just before the sun was setting, created some amazing contrast between the pink of the sky and the almost blue looking ice. It’s cold here. I set up a tripod and started looking at different angles and views. My hands are freezing and the snow is crunching underneath my feet. It’s dead silent out here. Puddles of waters are appearing where the ice is melting. 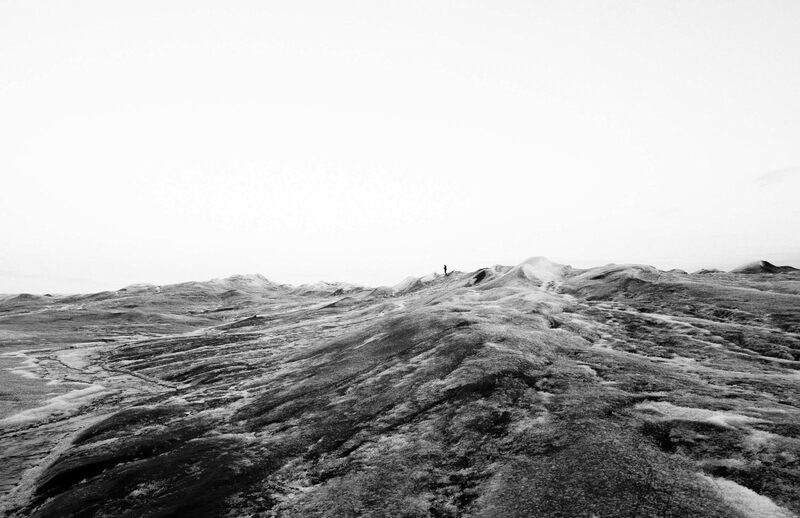 I walk a little bit further into the ice sheet, forgetting which direction I came from. I look around and see my guide waving at me from far away. The sun has set and it’s time to return. I consider my self-lucky enough to be able to set foot on this ice sheet and observe it for a short time. I have only spent a couple of days here and therefor only talked to a few people about possible effects of global warming. While for some people it is a big worry, I have also learned that to some people a warmer or longer summer will bring new possibilities, especially in the southern parts of Greenland. The farmers can now grow potatoes or other vegetable, which for many years wasn’t possible or very hard. Previously, all the vegetables were imported in a high cost. From Kangerlussuag, my next stop was a little further up north. I boarded a small airplane with no sitting order. This gives the first one in, a great opportunity to score a window seat. As we took off, I pressed my self to the window and watched the landscape changing. It looked so untouched by humans, huge tundras and lakes. The plane ride was under an hour long and when descending above the Iceford in Ilulissat, I got excited to see the icebergs floating on the sea. After all, this is where the ancient ice calves off the ice cap and floats into the sea. On an early morning, I set off towards the Icefjord. The park, which is a UNESCO World Heritage Centre since 2004, has a few walking trails and an old Inuit cemetery. The easiest trail will take you straight to a spot from where you can observe the Icefjord, which is situated where the Sermeq Kujalleq glacier calves in to the sea. Even though during winter the area is frozen and solid, this glacier is still one of the fastest moving and most active glaciers in the world, now moving twice it’s speed compared to twenty years ago. Standing above the Icefjord, you can hear the active ice and calving process. Once calved, the ice blocks slowly move towards the bay, where each of them touches the sea bottom (about 200-250 m deep). 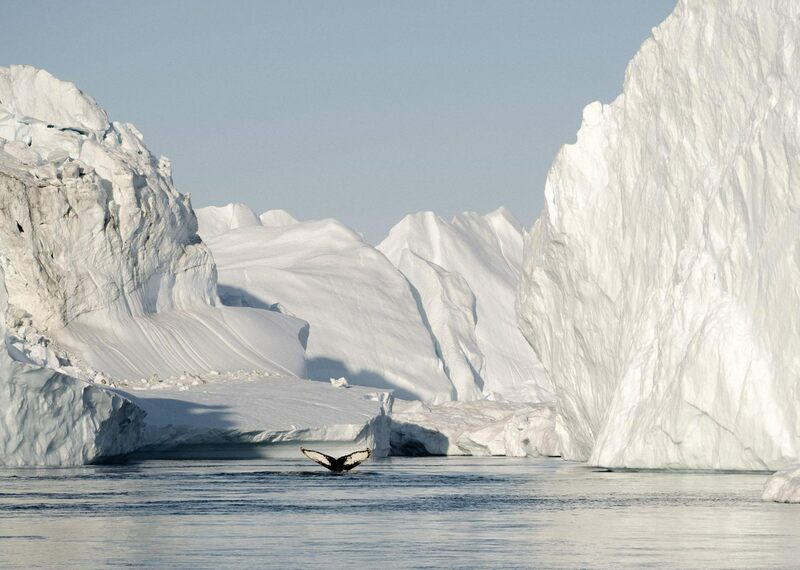 To observe these icebergs from closer, one has to go on a boat and get as close as they can. Icebergs are formed from heavily compacted snow and rain that fell on the Greenlandic ice cap over one hundred thousand years ago. During this process, small air bubbles were created which are released with the breaking of the ice, giving off a sound similar to a gunshot. 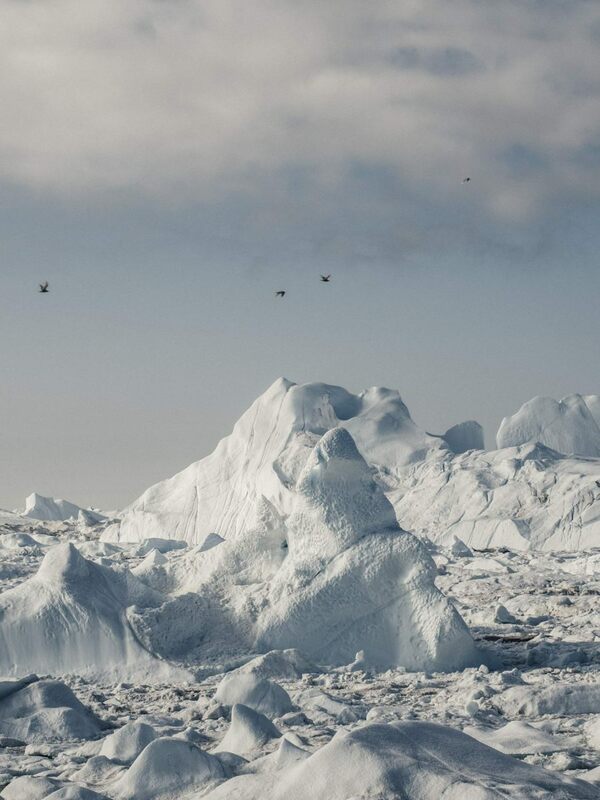 The ice cap is in constant movement, pushing icebergs of different sizes and shapes into the sea. 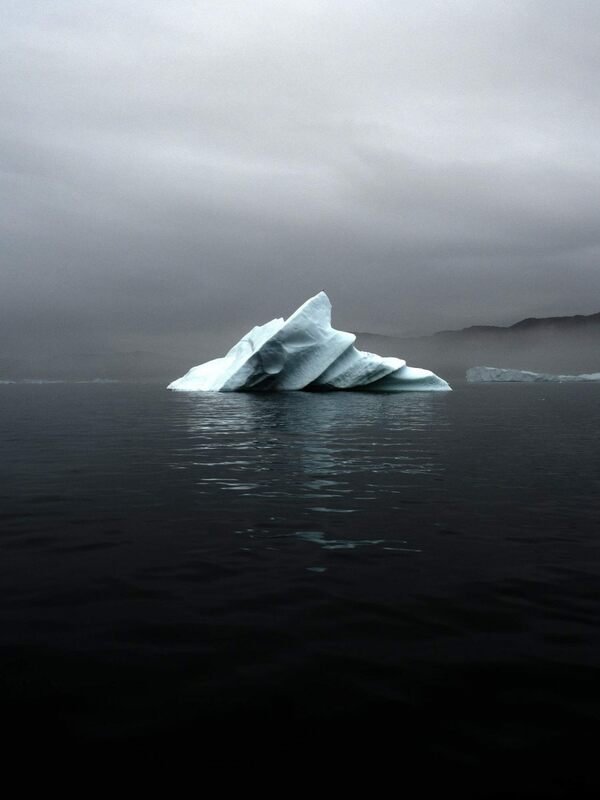 No two icebergs are alike. Once a smaller piece breaks off, there is a chance that the iceberg will turn around, changing completely the look of the whole iceberg. 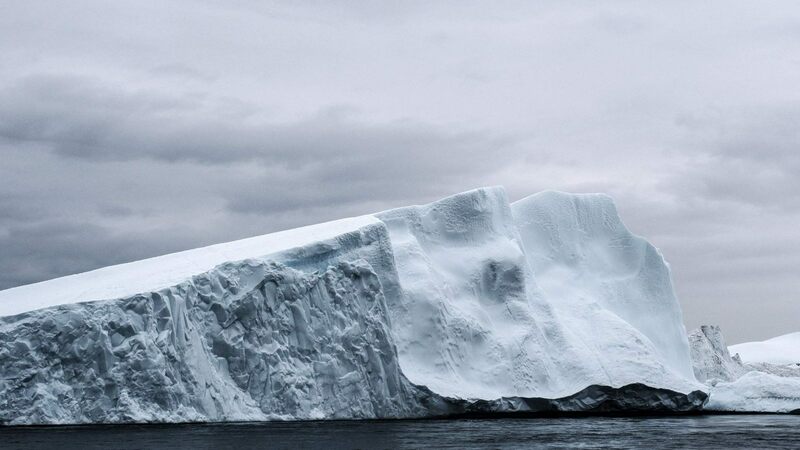 Because of this process, each day icebergs look different and there is always a chance that the iceberg you see, it has not been seen by anyone else the previous day. I made my way down to the harbor where the fishermen stood on their boats, preparing to go out for the day. Big plastic buckets in front of them, they were cutting chunks of whale meat and putting it onto hooks. In the mean time, some came back with big plastic bags with roughly chopped seal meat to feed their families and neighbors. I stayed for about an hour, watching their day. anytime and for the last few years, almost all year around as the summers are longer and the weather is getting warmer. “You see? While the wildlife has a hard time to adapt, us people are doing just fine” But I ask my self, up to what point? I noticed this myself. Three cruise ships in one day, with a fourth one coming the next day – one thousand people on board. The big boats are bigger every year and this place is not going to be able to handle it soon. While Greenland was the first one to talk about the effects of global warming, the tourism here bloomed in the past couple of years. The locals aren’t happy. 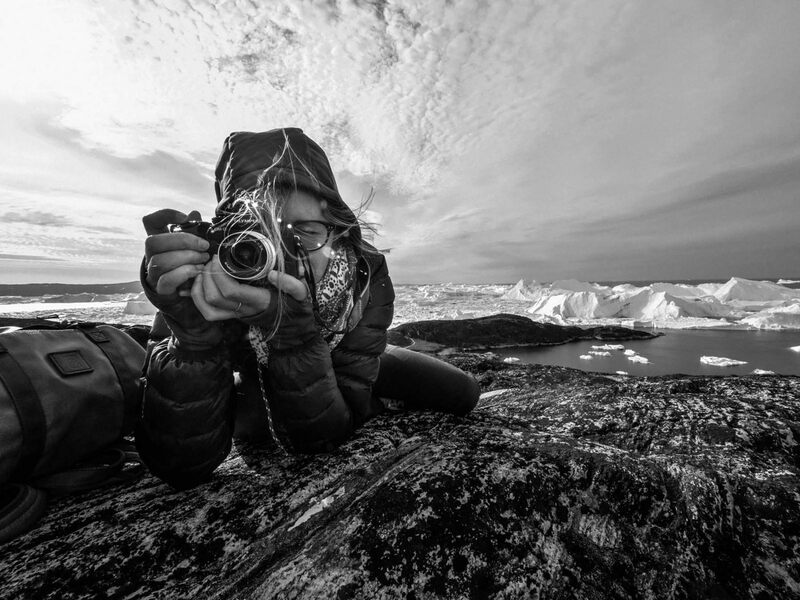 While tourism can boost the economy, it’s harming the nature and beauty of Greenland. There is no doubt that global warming is an effect of the human hand. It started to rain and it rained for the past two days. The land was wet and the hiking trails completely under the water. I took a little local boat to Rhodesbay, or in Greenlandic, Quaatsut, a small settlement 14km by boat (24km by foot). Fifty years ago, the settlement was home to more than two hundred people, these days, they are down to 45. People have moved to Ilullisat for better schools and job opportunities. I have visited a local school, which is attended by four kids. This town is completely cut off from everywhere. I spent about 48 hours here. While people come for a day trips, staying here for couple of nights, will make you feel a bit more part of the local life. There is one fisherman in town, with no English, however, he had greeted me and we exchanged a few words and hand gestures. The winds are strong. It has now been raining for four days straight and only a couple people left their houses in this small settlement. I used these rainy days to learned more about the town. The name ‘Rodebay’ (in Dutch) means ‘red bay’ and was a home to Dutch whalers in the 18th of century. Whaling was not monitored in the past the way it is now. The population of whales has grown in past few years, which is wonderful. On the way back to Ilullisat, I decided to hike. It was the first day with no rain and I felt positive about completing the hike in six hours as the roads were clearly marked. However with the days of rain, it was impossible to stick to the hiking trail, as most of it was under the water and the rocks slippery. At times the water was knee-deep, even small bridges, built to aid the trek were submerged. The rocks were slipper and the water was too deep and freezing cold. Carrying my camera bag above my head, with carful steps, with water rushing by, I completed the trail. The weather has not been on my side for the past four days and so after arriving to Ilulissat, soaked and cold, I took a warm shower and went out to say hello to the locals at the art workshop down the road. 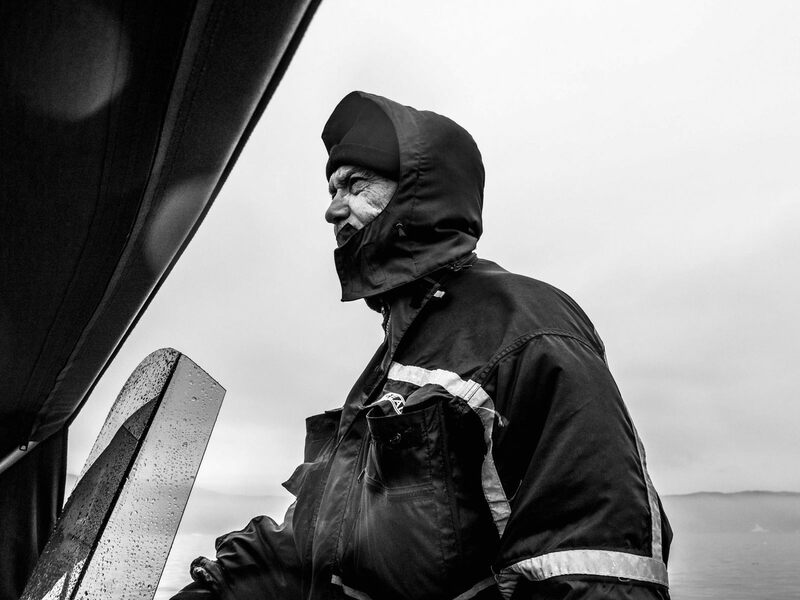 I spoke to Karl about his work, his art and of course about the weather changes here in Greenland and what it means to him. He described how the weather has been changing since he was a child. The rainiest months were October and November, while these days the rain falls any month of the year. Unfortunately the heavy rains in summer season can speed the ice melting. At this time of the year, there is not much actual snow on the ice to absorb all this late summer rain and as a result, the ice sheet is moving faster. I slept for about eleven hours the night. Waking up to a bit of rain and very cold weather. I walked down to the harbor where I took my last trip to see Eqi Glacier. The Greenlandic name for this place is Eqip Semia. It is also known as ‘The Calving Glacier” as through the day small and big chunks of ice break off at regular intervals (almost every 15min). 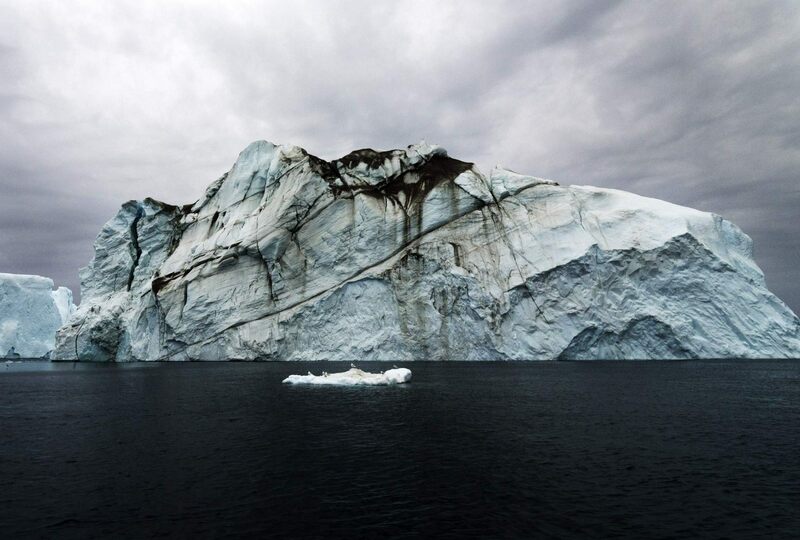 The Glacier is located about 80 km from Ilulissat towards the north and it takes about four hours to get there by a larger boat. Even though Eqi glacier isn’t as big as the one at Sermeq Kujalleq in the Icefjord, the fact that you can get closer and it’s more accessible makes the trip worth the hours spent on a boat. As I stood on the boat, in Greenland, with the setting sun, pink skies, quietness all around me, everything felt so peaceful and beautiful. Watching the Glaciers being active, captivated by their power, I forgot all about the outside world, the impacts and the problems. I was standing on dead silent water, when I heard whale breath out loudly, I could hear how the ice moved and cracked… For a moment I forgot everything else and was absolutely absorbed by the beauty of this place. Now, while sitting at home, I wanted to share these moments with you. I am not here to tell you how to live your life; I am here to show you the beauty of this place and what we could possible lose.